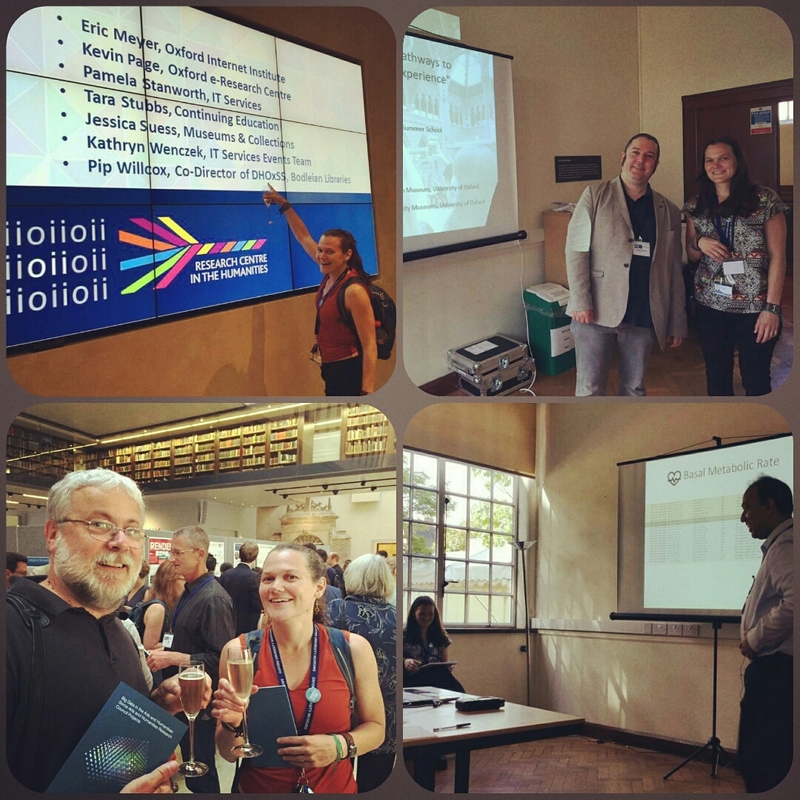 This year I have been pleased to become involved with the Digital Humanities at Oxford Summer School, both sitting on the committee that helps run and steer the event, and giving a short presentation. The summer school is a week long event that offers training courses to anyone with an interest in Digital Humanities, from undergraduates to academics. This year it offered eight week long workshops in areas such as Digital Musicology, Text Encoding and Linked Data. This is supplemented by guests lectures and panel discussions. This year’s conference was a huge success with more participants than ever before registering – we sold out – a wonderful launch event at the new Weston Library that doubled as the launch of a new AHRC Digital Transformation publication, a Digital Transformations panel discussion, and a keynote talk hosted by TORCH on Fundraising Through Digital, given by Michael Docherty, Director of Digital at Cancer Research UK. Add Oxford dinners and a few drinks and it was a very fun week. I gave a presentation with my colleague Anjanesh Babu, the Systems Architect at the Museums, on how we can track visitors around our museum spaces, and what we can use this data for. Anjanesh introduced the technology, but basically, if you are carrying a Wi-Fi enabled device – and Wi-Fi is switched on – your phone is constantly sending out probes looking for Wi-Fi. These probes are logged by our Wi-Fi Access Points (WAPs), regardless of whether you log onto our Wi-Fi or not. This means, that if we enable certain software on our network management system, we can collect this data and use it to track visitor pathways around the museum. This is something that we are exploring at the moment and hope to pilot of the museums shortly (as soon as we sort out the legal questions around notifying visitors of this activity). We won’t be using all our WAPs, they would be too numerous and the data to complex to understand. What we will do is activate a number of WAPs at key locations, and based on when your device engages with these WAPs, we can infer which pathway you have taken through the space and how long you have spent. A good case study to describe this is the Museum of the History of Science, as it has a basic floor plan, and poses a few key research questions. Visitors enter the museum on the middle floor, and can either go up to astrolabes and armillary spheres, or down to early photographic equipment and Einstein’s blackboard. By activating WAPs at the entrance/exit of the museum and each floor, we can determine in which order audiences choose to visit each floor, and how long they spend in each area. We can also test how we can influence this behaviour through signage and proactive staff engagement, testing different things for different periods of time. The museum also has a free special exhibition space in its lower gallery, and since it is not ticketed it can be difficult to determine visitor numbers to the space. By activating WAPs near the entrance and exit of the exhibition we can track visitor numbers, how long they spend in the space, and how many people enter at the wrong end and do the exhibition backwards (and again experiment with different methods of preventing this). This technology is commonly used in commercial venues such as shopping centres, but there are not yet many examples of this in museum spaces, and as trusted spaces there is a question of how the public will respond to this activity. All the data we collect on people will be anonymous, we will only have the user’s MAC address, no information about the individual, and hopefully we can clearly communicate the message that we will be collecting this data purely to spot trends so that we can improve our service, and not to stalk individuals. This did, however, lead to talk or other things we could be doing. There is a strong trend within the cultural sector at the moment to deliver people content based on their context, usually location and proximity to objects, primarily using iBeacons – a technology that we have steered clear of as they do not work particularly well in our museum spaces which have a lot of glass and metal that can cause the signal to bounce around, and which require the user to download an app, enable blue tooth, etc., so there are a lot of barriers to engagement. But location is only one type of context. There is no reason (beyond the investment in processing power) that museums could not do what Amazon does – you liked this object (based on how long you spent near it or if you watched an entire video on it) so perhaps you will like this? Also, it is now possible to sign in to most Wi-Fi networks using Facebook, in which case we could know your preferences before you even do anything. The barrier to this kind of delivery (beyond the extreme creep factor) is primarily developing personalised content. The technology to determine a person’s context and to push them content exists, but it is developing appropriate content that is extremely time consuming, and incredibly difficult to resource. Besides, do people really want that in museum spaces? This entry was posted on July 25, 2015 by Jessica Suess in Museums.